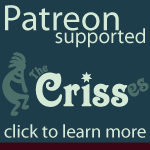 This is a listing of Filks currently on line by The Crisses. Warning: we are not responsible for groans, nausea, stitches in your side, snarfing, or any other accidents related to ingesting our filks. Read filks at your own risk!